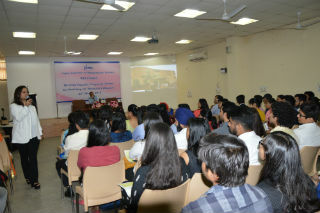 A motivational workshop was organized to unleash the unlimited potential of individual by talking on various hidden potential facts. 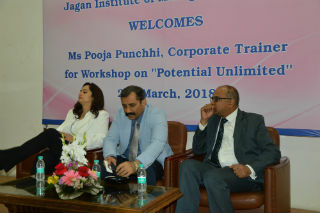 This workshop was enlightened by the pearls of wisdom and knowledge of Ms. Pooja Punchhi and Mr. Vijai Vardhan. 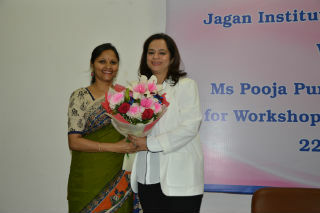 Both were the eminent speakers who added brightness in this session. •MR. 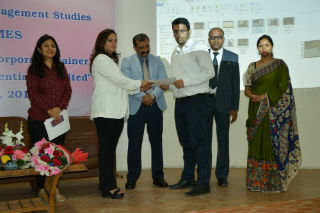 VIJAI VARDHAN (Additional Chief Secretary, Department of Tourism, Haryana) – Graduate and Post graduate in History from St. Stephens College, Delhi University. He joined Indian Police service in 1984 and Indian Administrative Services in 1985. He also held important assignments with government of Haryana. He is drawn to the mystic and has a deep and abiding interest in Sufism, Confucianism and Taoism. He has also authored seven books till now. Most famous book is Kurukshetra. He was chosen by the United Nations development Program to undergo an advanced course in Urban Development and Regeneration in Singapore, malaysia and Indonesia. As a voice over artiste, he lends his voice regularly to documentary films, theatre, social causes and poetry festivals. He also has a music band ‘Sajda’. •MISS POOJA PUNCHHI (Life coach at Freelance work India) – An optimistic lady with expertise in holding workshops on making people known to their potentials. Coming out with the best within you is her goal. She also works on improving individuals’ self-esteem. She is also certified practitioner to access consciousness. Success is what you make it ..!! # Heart is louder than voice… How to overcome Fear? # Why Change is Difficult? - Bringing a change is a sign of strength. # In life – How to Run/Walk/Pause? # Difference Between Grabbing a Opportunity and Opportunist? # 3 C’s in Life- Chance, Choice and Change. # Biil Gates success story. “ALWAYS BELIEVE IN YOURSELF AND ALWAYS STRETCH YOURSELF BEYOND YOUR LIMITS. YOUR LIFE IS WORTH A LOT MORE THEN YOU THINK BECAUSE YOU ARE CAPABLE OF ACCOMPLIHING MORE THAN YOU KNOW.